All lash artists know how critical it is to have optimal humidity levels when lashing. 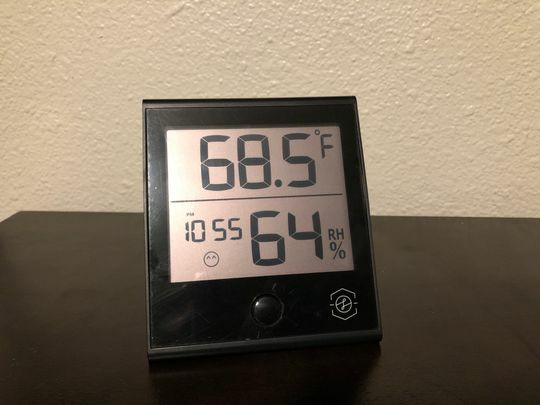 Our Hygrometer displays both the temperature and the % rH (humidity) reading to easily determine the levels of humidity in your lashing space. With the hygrometer you can use it to help tweak your surrounding environment and get that sweet spot your adhesive loves. *Please note that there is a protective film on the surface of the hygrometer which needs to be removed upon use. Please note that there is a protective film on the surface of the hygrometer which needs to be removed upon use. The hygrometer has totally changed my lash game! It is so easy to use and helps me keep my room at the right temperature and RH. Before I was just guessing and thought because my thermostat was set to a certain temperature that is what my room was at. Come to find out that room stays about 2-4 degrees cooler which was causing me some major headaches with my adhesive and I couldn’t figure out why. Hygrometer to the rescue! My adhesive works amazing now! We are so happy to hear that you were able to control your humidity! Best Hygrometer I’ve purchased- great display & super chic look! Wonderful! Thank you for your feedback Jessica. It’s so pretty to look at and does the job it’s meant to do. We are happy to hear Latoya! Love being able to tell why my adhesive may be not acting how I like. Plus so nice that it has the clock feature. Tellement utilise comme produit !